Wings to Soar helps special needs students see the flip-side strengths that often go along with their different brain wiring. Founded by Beth Ellen Nash, Wings to Soar was established to help dyslexics and other outside-the-box learners break the chains of shame, failure, and inadequacy that so often surround learning challenges. In 2011, Beth Ellen shifted toward an individualized online and homeschool hybrid option and founded Wings to Soar Online Academy, specializing in the creation of custom Path to Success™ Personalized Learning Plans for dyslexics and other outside-the-box learners for kindergarten through 12th grade. 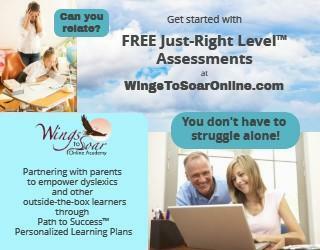 Wings to Soar Online Academy helps dyslexics and other struggling students through online personalize learning programs. This program is excellent for special needs students. They have a free Just-Right level Assessment that you can try for free. Wings to Soar will take the learning concerns that are indicated on the assessment to create a customized set of assessments for your child. This is the first step in creating their individual learning plan that will address their specific needs. Wings to Soar offers not only individual language arts and reading programs but also self-paced video-based courses. At the middle and high school level, they also offer teacher-led small-group (4-8 students per group) webcam classes for writing intervention, as well as Integrated Liberal Studies courses that weave together social studies, literature, composition, and study skills.